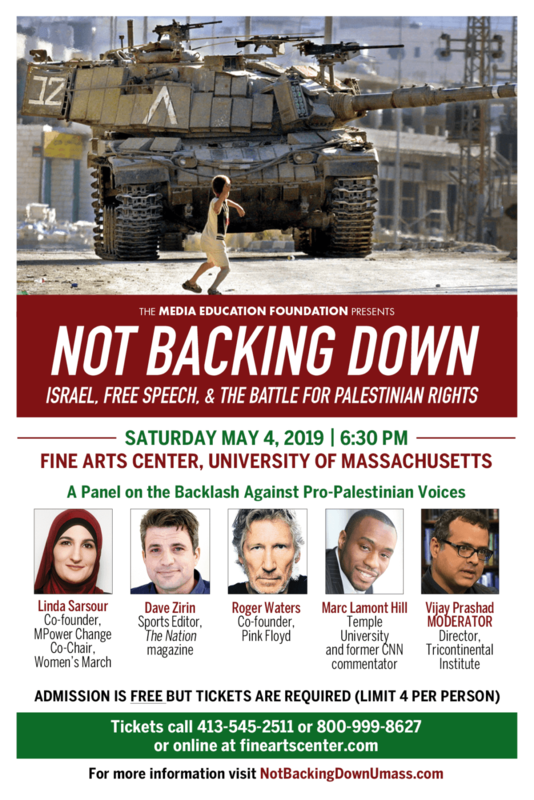 Save the date for this high-powered panel on the accelerating backlash against pro-Palestinian voices – to be held May 4 at 6:30 p.m. at the UMass Fine Arts Center. “Not Backing Down: Israel, Free Speech, and the Battle for Palestinian Rights” will address recent attacks on Rep. Ilhan Omar and other progressives who have spoken out against Israel’s 50-year military occupation of Palestinian land and pushed back against the claim that criticizing Israeli government policies is “anti-Semitic.” The panel will feature prominent activists and journalists who have themselves been attacked, smeared, and branded “anti-Semitic” for speaking up on behalf of Palestinian rights. Panelists include: Legendary rocker Roger Waters of Pink Floyd fame, who has been repeatedly vilified as an “anti-Semite” for his outspoken criticism of the occupation and his staunch support of a cultural boycott of Israel. Palestinian-American political activist Linda Sarsour, a co-founder of MPower Change and co-chair of the Women’s March, who was recently targeted by a private Israeli intelligence firm as part of a coordinated, U.S.-based campaign to stop her from speaking out against Israeli policies on American college campuses. Marc Lamont Hill, a professor and political commentator who has visited the occupied territories with Black Lives Matter and was fired last year by CNN for remarks he made in support of Palestinian rights. Nation magazine sports editor and author Dave Zirin, a frequent contributor to MSNBC and ESPN who has been called a “self-hating Jew” for his criticisms of Israeli human rights abuses, his outspoken defense of Ilhan Omar, and his support for NFL players who refused to go on a promotional trip to Israel funded by the Israeli government. The panel is being organized by the Northampton-based Media Education Foundation (MEF).